I’ve been hoping and wishing and praying for this moment since I bought four boxes of books from my friend back in 2004. 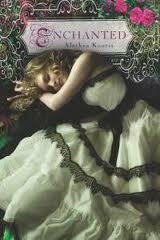 ENCHANTED has made the final ballot for the 2012 Andre Norton Award for Young Adult Science Fiction and Fantasy. I…I don’t even know what to say. Except maybe “thank you” to all the SFWA members who nominated me. I only hope Miss Andre — and my grandmother — are looking down on me right now with pride. And now I have to figure out how to get to San Jose in May.